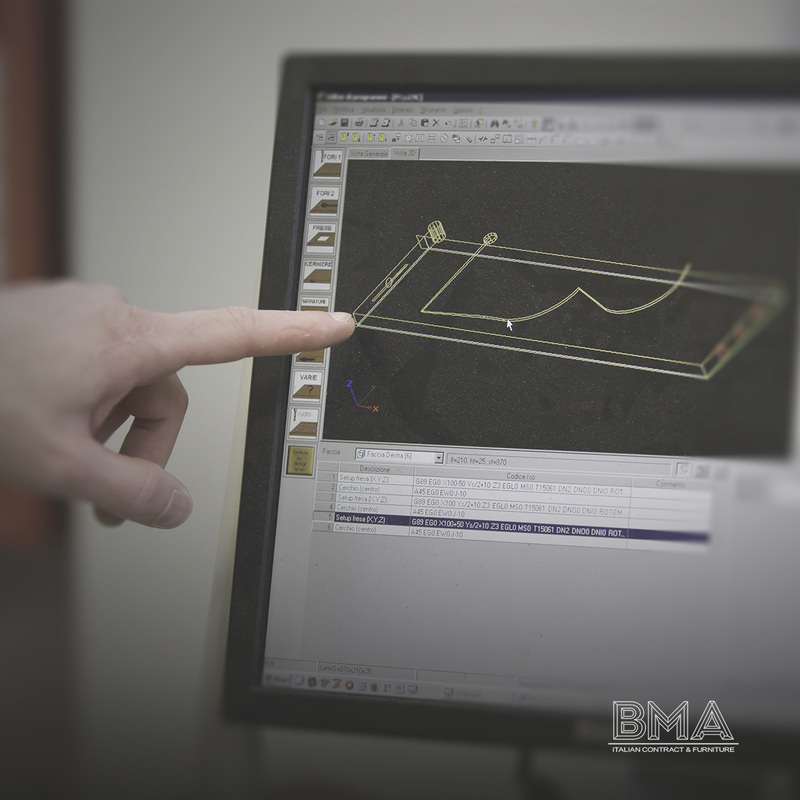 BMA has been structured in a way that allows it to grow by prioritising quality and technological research. The refined manual skills of the production department are combined with automated work centres, resulting in products that are beautiful both in their precise finishing and in the final creation. 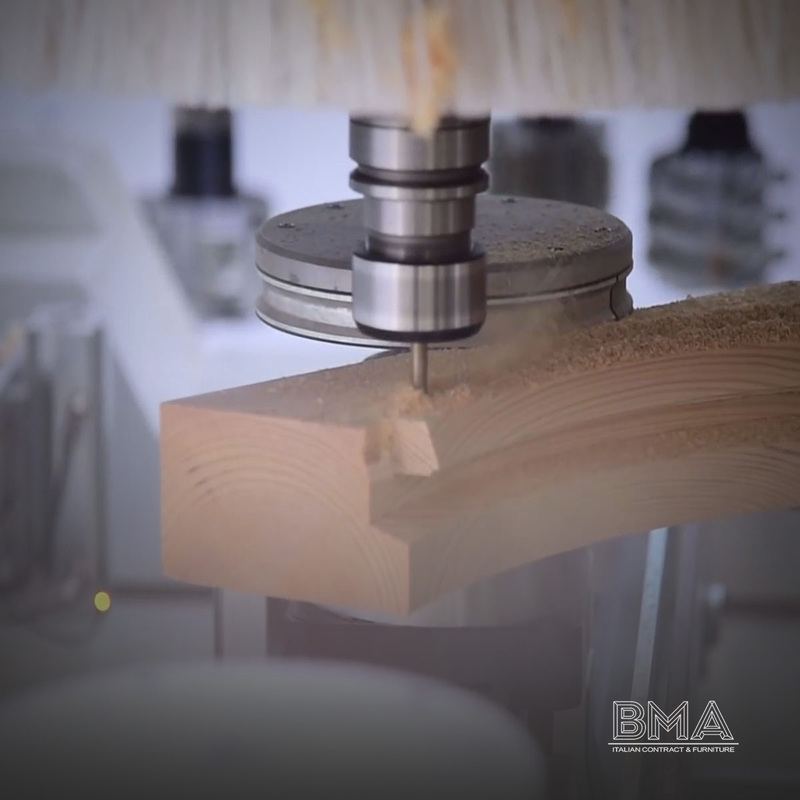 BMA - Italian contract and furniture considers prototyping to be a fundamental step in the realisation of each project. Thanks to this service, customers can evaluate finishes and materials and make changes, while the team of carpenters can plan the production with complete accuracy. For some types of products, the company creates a prototype or mockup that shows the result in its real dimensions, in order to evaluate production times and costs. The details are not overlooked either. When we find ourselves faced with critical issues caused by small technical details while producing the furniture, the obstacle is studied by the engineering department which then designs the changes, and these are generated in real time by making use of three-dimensional printing solutions. For 3D prototyping we use a Delta WASP 2040 Turbo2. Precise and reliable with all materials, this is the fastest printer in the world and features a new integrated industrial class 32bit card. It is supplied with a power system that can support 2 high power extruders. The Turbo 2 has a new trolley sliding system that increases its speed and accuracy. 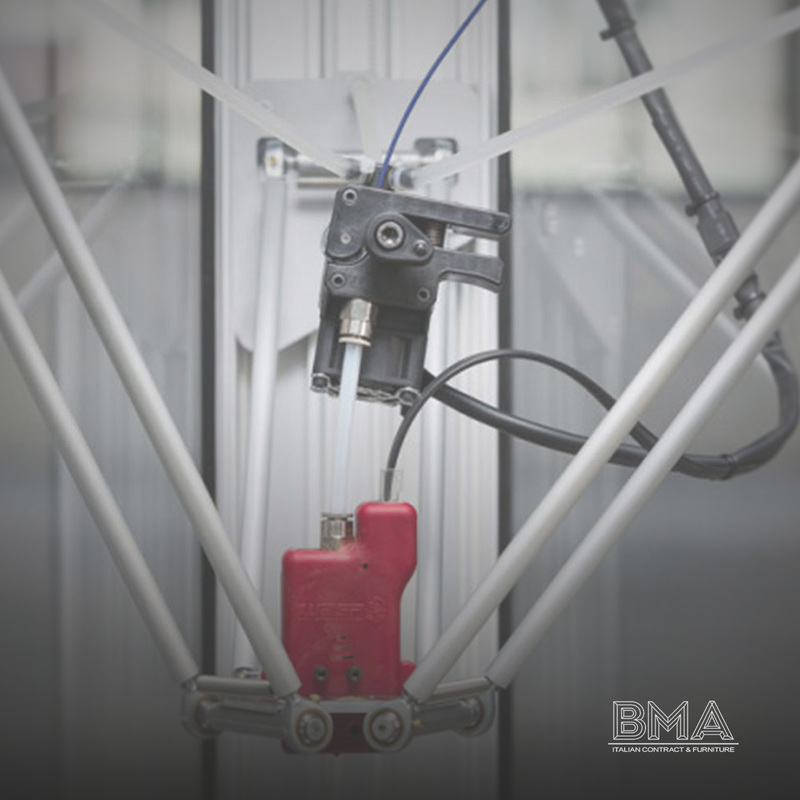 The chamber has been better insulated to be able reach temperatures suitable for printing technical materials, and it is equipped with a cooling system for engines and boards as well as a kinematics system for high temperatures. 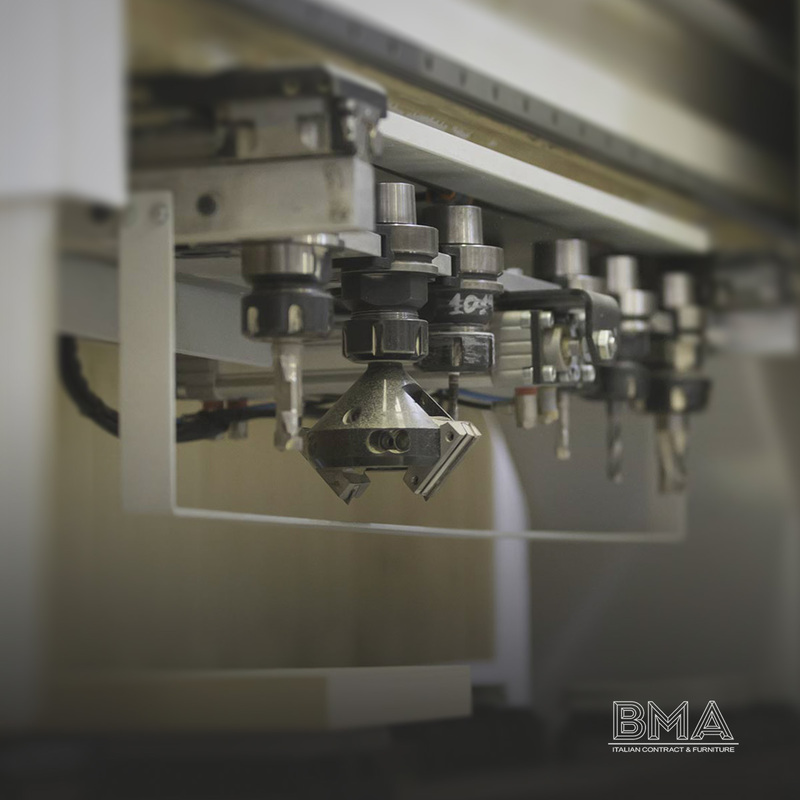 BMA Italian contract and furniture has CNC numerical control machines that optimise production and can be used all kinds of processes, even those requiring a more complex shape. Machines alone do not mean quality, however. Our production operators are expert carpenters first and foremost, and technology always require someone who knows how to use it in the best possible way. As such, to us innovation is also synonymous with "professional training", and our carpenters evolve in parallel with their tools. 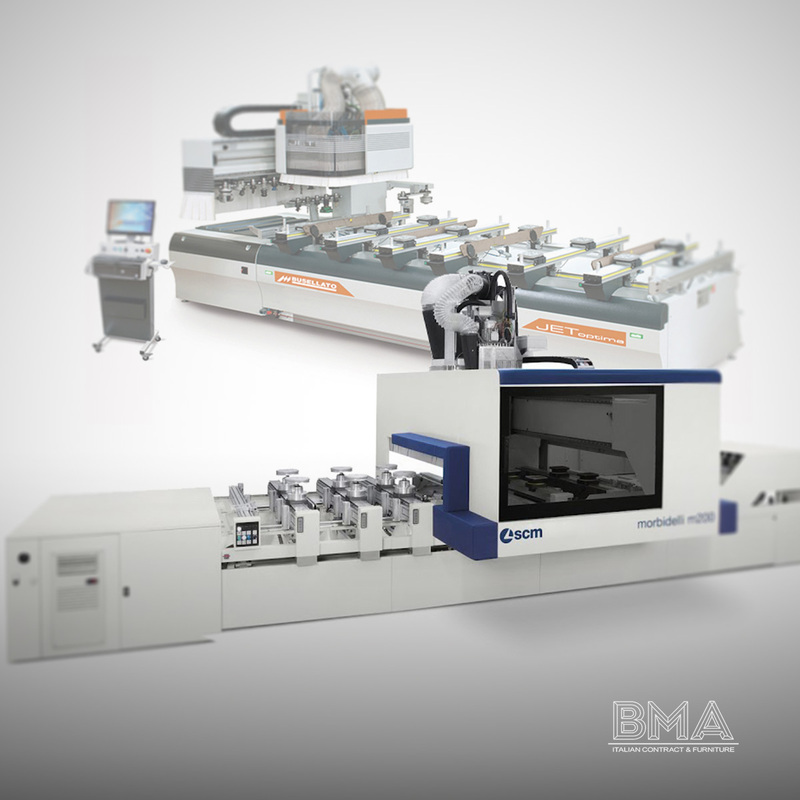 This highly modular machining centre provides answers to all the problems associated with woodworking and with advanced materials processing. Just a few clicks to design and manufacture pieces of any shape, the machine is run by the Suite Maestro which has specific modules for every production cycle. 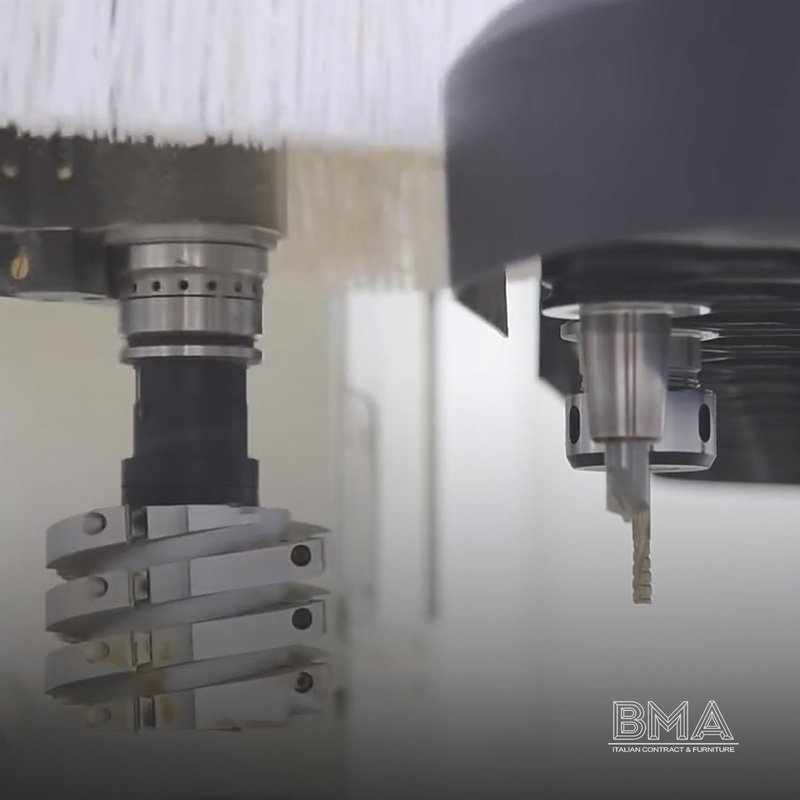 60% time saving in drilling cycles thanks to the rapid working/cycle time and devices that reduce the idle times, no downtimes for setup operations with the TV FLEXMATIC work table, and less than 15” for the tool change with the FAST14 tool changer. 5-axis direct-driven spindle head which ensures the total absence of vibrations even with huge material removal at high speed and with the high-performance drilling heads with RO.AX (Rotoaxial spindle technology) spindles and rotation speed up to 8000 rpm. CNC working center purposely designed for manufacturing furniture parts, furnishings and hollow core interior doors. This 3 or 4 axes compact working center (5th positioning axis) offers performances equal to those of higher level models and represents a very good investment for all craftsmen.